Yep, he must have done. But in FYEO, he has a silent role whereas in The Ojuka Situation, he had more lines and kept taunting Doyle. Besides Tim Cook, another Sweeney connection in the movie was Paul Angelis (Stoppo Driver) as one of Topol's hit squad. And Julian Glover from 'Queen's Pawn'. Great to see we now have our own Professionals Forum. Andrew Pixley's books have been superb and I've really enjoyed reading them. I was interested to hear that Lewis Collins started turning up late on set. It has always been a complete mystery to me why he didn't achieve stardom after the Pros but these insights potentially give a few clues why he didn't. I'd be hugely interested to read his autobiography but sadly it still hasn't been published as far as I am aware. I think there must have been quite a few reasons why Lewis was late. Maybe he was living up the party lifestyle and also was getting a bit fed up with the show itself. Apparently, he and Martin Shaw wanted to leave at the end of 1979. That's good news. Especially for those that don't have a blu-ray player. Series 3 had some outstanding episodes such as Mixed Doubles, The Purging Of CI5, Slush Fund and Involvement. I've had The Pros box-set for a few years. Still has the cellophane attached. Most of the eps I watch are ones I recorded from 'Men and Motors' channel about 10 years ago. I remember when they were shown on Men & Motors along with The Sweeney then in 2007, ITV4 began showing them. I bought the original Contender DVD sets in 2003 then got the reissues at £10 each a few years later just to see the differences in picture quality. 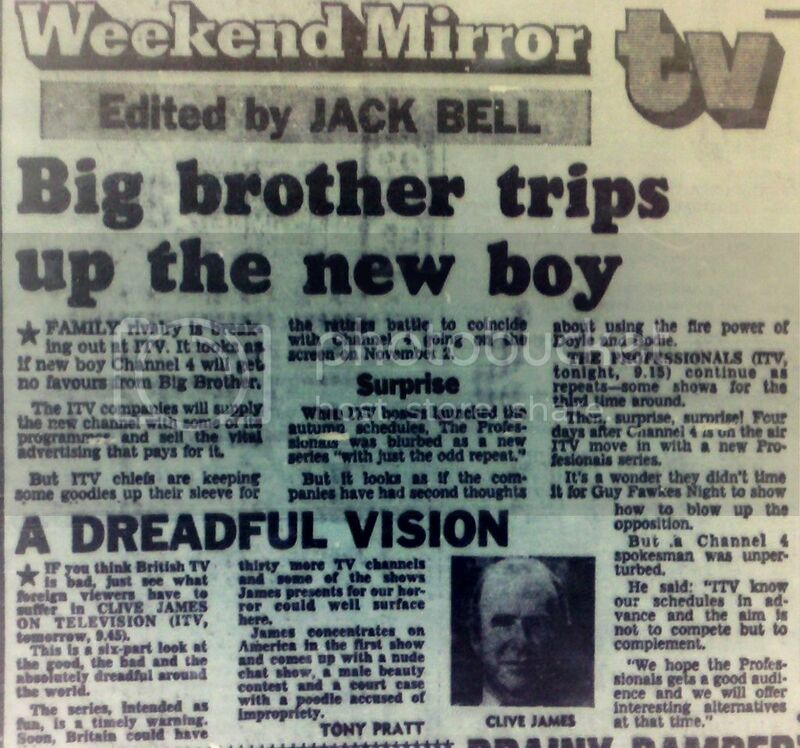 Here are a few short stories from The Daily Mirror regarding The Pros. Tonight at 0040, 'Gold' are showing The Comic Strip Presents - The Bullsh#tters. I haven't seen this 'spoof' Professionals featuring Bonehead and Foyle for a long time but iirc it's pretty good, i'll be recording it though as I've an early start in the morning. All 3 leads as James Bond. That would be a very expensive collection! The photos don't show it properly but there are actually 9 packs of 2 episodes in there for your 15.99 = 18 episodes (for around 11.50 GBP). They are sort of shrink wrapped very thin envelope packets - see the 10-18 at the bottom? Those are the collection (Kolecke) though in fairness my Slovak is zero. If my maths is correct that equates to about 36 squid for the entire series (though they only had these two there). Slovakia has a weird packaging system for some DVD releases. 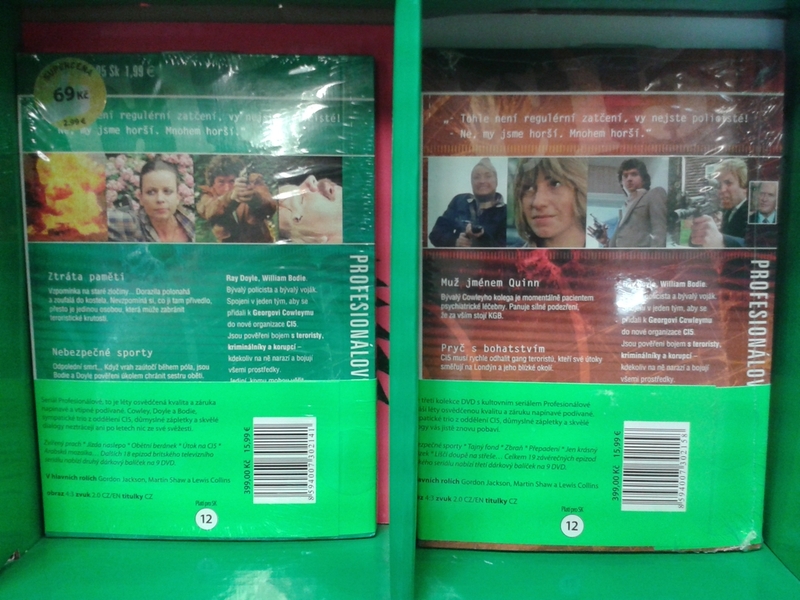 You can buy lots of series in shrink wrapped sets like this or individual 2 episodes as a single release too. I once saw Randall & Hopkirk two episodes only on a single disk for something ridiculous like 2 Euro. Excellent collection of pics there, jno, but a darn rip-off too, 15.99 for only 2 episodes, that's a disgrace, innit? I like the pictures they've used though on the front and back covers. The photos don't show it properly but there are actually 9 packs of 2 episodes in there for your 15.99 = 18 episodes (for around 11.50 GBP). Great to see covers from around Europe. There must be so many variations. 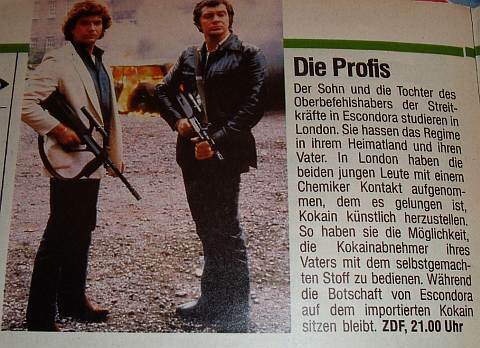 The Professionals was huge in Europe, especially Germany, but couldn't quite crack the US. Probably not a great fit for PBS which was more costume dramas, traditional mysteries and Brit-coms, and the main channels had Starsky & Hutch. Something like the Pros would probably do better today as there is far more channel choice and demand for variety in the states. That's true. I have a feeling it would be a hit on HBO or Netflix. Also at that time back in the late '70s/early '80s, there was a crackdown on TV violence in the US which meant that The Professionals would have been too tough and gritty for audiences' tastes. I heard it was shown on a cable channel in America and a few years ago, someone commented on youtube that he wished he could have watched something like this on either of the main network channels (NBC, ABC and CBS) as he felt they were awash with bland trash. Yeah, I think especially with the popularity of quality actor tough guys like Ray Stevenson and Idris Elba, Lewis Collins would go down really well with American audiences today on the cable channels. A bit ahead of its time, in a way, at least as far as American television has gone. True and a few years ago, there was the remake of Life On Mars which suggests that the Americans still love their old-school tough guys. He would indeed as would Ross Kemp if he was still acting and someone like Philip Glenister. Whats really odd, thats in todays world of FB and the net, Michelle Beckley has never resurfaced; and I've been unable to track her down......sincerely hope she is still with us. Me, too. If she is, she must be at least in her mid to late 40s. BTW great news regarding MK IV. Yep it should. I reckon it will be a plastic case with a middle plastic glass page to house the extra discs. Yes good news about BD set! Regarding Ms Beckley, she'd be around 47 now ... just sent a mail.